How ribosomes are synthesized in the nucleolus? The rRNAs namely 18S, 5.8S and 28S rRNA are transcribed into a precursor molecule, a 47S transcript which is further trimmed by spliceosomes (snRNP U3) and nucleolin. The 5S rRNA transcription occurs in chromosomes existing outside the nucleolus. The 40S and 60S subunits are assembled in the nucleolus later transported to the cytoplasm separately. 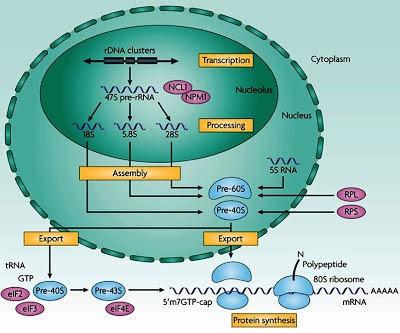 40S subunits are synthesized and transported earlier to the cytoplasm than 60S subunits. This may be to prevent assemblage of 40 S and 60S subunits within the nucleus. Ribosome formation in the nucleolus is completed in three distinct regions of the nucleolus. 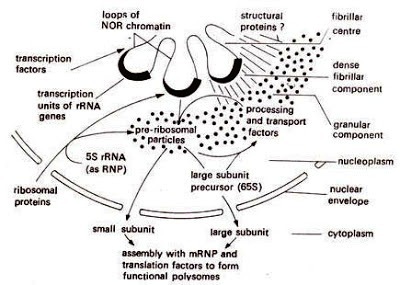 Three distinct regions are identified in the nucleolus where initiation, progression and maturation of ribosomes occur. These distinct regions are as follows. Fibrillar centre is the innermost region of nucleolus where transcription of rRNA genes is initiated. Nucleolar organizers of chromosomes are located in this region. Dense fibrillar component: This is the region outer to the fibrillar region where RNA synthesis progresses. Cortical granular components is the outermost region where processing and maturation of pre-ribosomal particles occur.